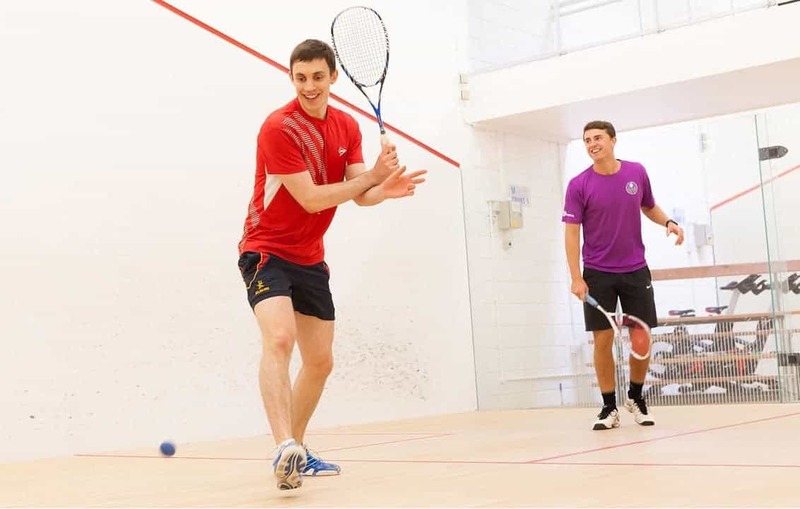 Squash is known as the sister sport to tennis. Featuring similar scoring systems and equipment, the game has evolved immensely since it's humble uprising in the early 1800s. Today's game is often played at indoor facilities that are tailored to the sport. The most common surface type for the court is hardwood, which is often treated and attended to for lift on the ball. Just like any other sport, proper footwear is essential to the impact you have during match play. Manufacturers have mastered the indoor court shoe, often extending new designs and releases multiple times per year. Finding the correct shoe is not always a simple task for the user. Below we've created a buyer's guide to help familiarize the consumer with the different aspects and components of a squash shoe. We have also taken the top 8 products on the internet and have reviewed them with in-depth analysis. Finally, we have taken puzzling questions that often arise and have backed them with detailed responses. HEAD is a widely known brand amongst the squash and tennis community. This low-profile build is the perfect fit for those looking to be quick on their feet. It helps counter lateral movements with the proper holding mechanisms at the ankle. The upper of this shoe is treated with synthetic and leather materials, giving the user ample holding and durability in that area. The outsole is made from gum rubber, which is designed for better traction on smooth surfaces. Gum rubber is also non-marking, which is a nice inclusion for court protection. The outsole rises about an inch into the midsole, providing protection for all intensive movements a user would perform during play. This model also includes a proprietary staple known as HyBrasion. This technology reduces wear over time and reinforces the main areas of use in the toe box, the midsole, and the heel counter. The outer shell is created with Air Mesh technology, allotting your foot the breathability it needs. Breathability is also important due to the snug fit of the shoe. Salming has created a hot take on durability and lightweight functioning with their Viper 3.0 squash shoes. The material build is designed with a treated leather that surrounds the upper and runs down the sides of the outer shell. This helps keep wear as an afterthought. The fill-in material is where the mesh resides. This keeps the user light on their feet and able to perform the shifty movements needed to succeed. The outsole is made from a strong, rubberized compound. This compound is a harder material, which keeps push-off and landing as a stable notion. RollBar technology is used within this model to help with lateral movements. This technology is proprietary to the brand and is the perfect fit for countering any sort of directional changes. The heel cup is treated with Ergo technology, which is comparable to that of a form-fitting memory foam design. This keeps the user comfortable and reduces the physical wear one experiences during pace of play. The HEAD Sonic 2000 is a mid-rise shoe, meaning it completely surrounds the ankle with support mechanisms. The inner coating of the insertion point is treated with padded materials that help to form fit the ankle. This fitting method provides the proper lockdown on the ankle and the material rise helps to reduce twisting and ankle injuries. The outsole is once again treated with a thick, rubberized compound. The undercarriage of the shoe features the same wavy divots that have been popularized by the HEAD brand. This shoe also utilizes HEAD Heel Energy Frame support, which relates to the design and stability of the insertion point. This shoe is the perfect fit for those with wider feet or flat feet as it is more forgiving and form fitting to the user. Dunlop is a brand that is synonymous with both tennis and squash, making it a fierce competitor in the intended footwear space. Their squash shoes are made from synthetic materials and feature a simple build. This synthetic nature is reinforced at the upper and extends to both sides of the outer shell. The outsole is treated with a gum rubber covering that extends to the middle of the toe box at the front and tails to the heel counter. The inner portion of the shoe utilizes mesh materials, padding, and other such soft substances to provide a comfortable fit for the user. The laces feature a fastener, which keeps them out of your wear during play. This low-profile build features the simple design needed for the activity at-hand, reducing attention towards fancy upgrades or non-useful technology inclusions. Hi-Tec isn't a widely known brand, but their Sports Trainer has placed them on the map when it comes to the proper squash footwear. The material used in this model comes from a mixed bag, citing leather, textile, synthetic materials, and rubberized compounds on their short list of material inclusions. This mixed design makes the perfect selection for any user looking to gain some aspect of benefit from these materials. The textile build extends to the toe box, giving the user that abrasion resistant technology they design. The leather upper makes for comfortable insertion and increases the protection against wear and tear. The rubberized outsole is non-marking and flat to the ground, allowing for the user to make an impact when pushing off or gaining their balance. The use of materials in this shoe go a long way for producing results and precautionary measures needed for the game of squash. The women's shoe space is once again introduced by HEAD. Their Sprint Pro model is the perfect fit for those looking to stay light on their feet. The material used extends from a lighter, leather compound. This compound feels like that of fabric or mesh, giving it the lightweight claim. The thick rubber sole rises about an inch into the midsole, affording the user a large percentage of stability in this region. This large extension also helps to shock absorb as the user moves across the court, keeping stamina and fatigue levels low. The heel counter features a thick, reinforced rubber compound that extends slightly from this region. This helps to provide additional ankle support aside from the heel cup, which keeps your ankle happy and healthy. Salming makes an appearance in the women's space with this Kobra indoor model. This shoe is made up of fabricated and synthetic materials, bringing both durability and lightweight feel to the table. They have also included a proprietary foam mechanism that works to help the foot rebound and counter pressures. This relates directly to push-off and landing, producing less pressure on the foot and gaining the correct forms of contact with the surface. The outsole is also treated with the RollBar technology, which helps to promote the proper lateral movements needed for sport. The heel cup is also treated with the same Ergo technology seen in the men's models. This helps keep the heel planted and secure, while also providing cushioning comfort that keeps you ride smooth. Adidas makes a splash in the women's shoe space with their Adipower Stabil 10.1 model. This shoe is made from synthetic materials, catering to the lightweight notion. The outsole is made up of gum rubbers and the under portion of this area is treated with pressure stoppers. These rounded design frames help to counter the main pressure points on the foot, reducing wear on the foot and producing more comfortable movements for the user. Ringcore technology is introduced at the midsole, which again relates to support and cushioning. This area is also established to help absorb shock, limiting the pressures placed on the foot. The layers of the material are reinforced and backed to provide abrasion resistant technology for the user. While this video presents an informative look at squash shoes, it fails to concur for different brands, builds, and types. We will now breakdown some of the categorical areas that you should be aware of when purchasing your shoes. One of the most important features a squash shoe can possess is a durable build. Often times squash shoes will be compared to athletic shoes and running shoes. These shoe types fall short of favor due to the materials that are taken into production. 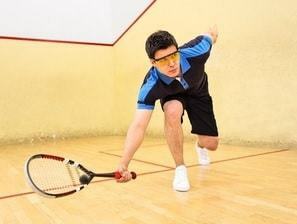 Mesh, netting, nylon, and other such lighter fabrics will fall short on the squash court. These materials are viable to tearing and wear quickly. The most common element used in a squash shoe model is a rubberized component. The allocation of this material will feature prevalence near the toe box, around the sides, and at the rear of the shoe. The build is designed this way to counter for directional movements and shifts that occur during play. The user is consistently changing their directions and pushing off from different angles. This keeps the outsole build at the center of the attention for the potential buyer. Rubberized components are often countered with leather comparisons. This build is both common and fitting for the user. Leather is a resistant material that reduces abrasions and will not split over heavy usage. Either of these two materials should have some say in the build of the shoe, otherwise you stand to make consistent re-buys to inconsistent footwear selections. As you rise to the midsole and the outer shell of the shoe, the material build becomes less invasive and reinforced. This is a common construction model and the materials used become less important as you rise up the shoe. This area becomes more of a case-by-case preference basis. The user will decide if they want to continue the strong build, start to lower the overall weight of the shoe with lighter materials, or create holding components at the insertion point. The back of the shoe, or the heel counter area should also utilize a reinforced or strengthened component to keep the ankle and heel in stable position. Lateral movements in the game of play are essential factors to wear, calling for action at the heel counter position for backed build that doesn't compromise with pressures. Since this game is primarily built around shifty play, a snug fit is desired. The user will be performing movements that call for quick weight shifts and entire body motions. You are going to want a snug fit to avoid foot sliding once placed in a pair of shoes. Try to find a shoe that runs true to size as possible. The most desirable pair is one that form fits the foot or one that is molded around the average foot size for that shoe size. This creates problems for individuals who have had foot problems in the past, calling for a shoe that is rather broken in when bought. The user who experienced past foot problems is going to want to opt in for the mesh, canvas, and other lighter materials in build. The user who wants the proper molded or form fitting option can extend their search to the leather, phylon, and other such stronger builds. A shoe that is too tight will grip at the sides of the foot and will crimple the toes in the toe box. A bigger toe box is not uncommon, and it will accommodate that natural sitting of the toes when worn. A little movement in this region is common and recommended. As you reach the sides, you should strive a fit when you feel the sides, but no pressure is applied to the sides of the feet. Practice by walking and if you feel scraping or rubbing, it is too tight for comfort. A shoe that is too large will also be something to avoid. If you can wiggle your foot within the shoe, angling it to any degree, the shoe is too large for play. This will quickly produce blistering and poses additional medical threats to your feet. The heel is another important area to host this prescribed, snug fitting. Upon insertion, your heel should feel as if it locks into place. To find an equal comparison, take the fit as if you were putting on a sock. A standard sock has a heel marking, usually established by a change of color. When your heel reaches this region, it usually slides snuggly within this pocket. Think of the back-inner of the shoe as a pocket for your heel. You should feel it drop in and it should take some twisting and applied pressure to remove it. A shoe that contains inner padding usually accomplishes this fit. The padding grips the upper portion of the heel and rises to the ankle. If you feel as if your foot is glued in or it takes to much effort to get it in there, the shoes are too small. If there is little resistance between insertion and heel placement, the shoe is too large. The material and fit are the two biggest areas to look out for when searching for squash shoes. While additional factors can and should be taken into consideration, they pale in comparison to these two mentions. Can I use running shoes for squash? The great debate between running shoes and squash shoes has continued to puzzle users. In short, you can use running shoes for squash. 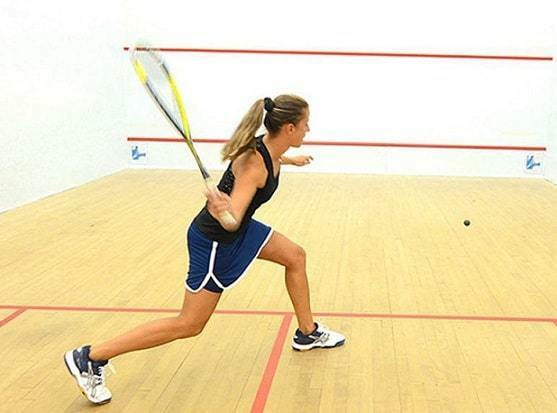 The greater question should be: Do you want to use running shoes for squash? No. These shoes are often designed with different rubberized compounds at the outsole, which can mark the court and reduce your effectiveness at push-off. Running shoes are also stable and not designed to undergo extensive, lateral movements. Squash shoes are rounded at the outsole to help provide these movements. This makes running shoes a misfit for the game of squash. Where else can I use squash shoes? The best part about squash shoes is that they are dual-purpose. You don't want to use running shoes for squash, but you can use squash shoes for running. Their counter mechanisms provide ample amounts of spring, which is perfect for the indoor track or smooth, outdoor surface. They can also be exchanged in the game of tennis with their built-in properties for court surfaces. This translates best to the hard courts but will also provide the necessary mechanisms needed for support on clay surfaces too. What are the best squash shoes for bad knees? With bad knees, you are going to look for increased support at the outsole and the midsole. These areas relate directly to shock control, which is a major contributor to knee pain. Some people prefer the memory foam build, while others like the EVA designs. Both can be a fitting option to help prevent knee pain. A thick, rubberized outsole will also contribute. This is a staple of most shoes, lending the user the option to select their preferred fit. What are the best squash shoes for shin splints? The shins are located near the knee area, so the same properties described above can be exercised during the selection process. Additionally, you want to look for the proper surrounding at the insertion point. Thicker padding around the ankle provides the correct amount of lockdown and produces a snug fit. Increased holding at the heel and ankle area directly benefits users who have dealt with shin splints. What are the best squash shoes for flat feet? Flat feet are a nuisance, but thankfully, there are squash shoes that help adjust for this setting. You are going to want to look for a rise in the midsole of the shoe. This helps to balance the pressures placed on the bottom of your feet and can even be utilized as a corrective measure for flat feet. A flat outsole works the user in the wrong direction and should be avoided if at all possible. Form-fitting options produce the best fit for flat feet. What are the best squash shoes for wide feet? If you have wider feet, you are going to want to stay away from the form-fitting options, as they reduce that space near the sides of the feet. A wide toe box is a good starting point. You want the toe box to maintain shape as it reaches the middle of the shoe. Heel width is relatively consistent amongst individuals, so the backing of the shoe presents little concern. Shoes that run true to size will represent the best options for wide feet users. What are the best squash shoes for plantar fasciitis? Plantar fasciitis correlates directly with the toe box of the shoe. You are going to want to adopt a wider toe box and a foot bed that allows the toes to splay naturally. If there is a narrow toe box, it will cause for irritation in the toes and may push them together, heightening your risk for this ailment. An accommodating toe box represents the best fit for users who have plantar fasciitis. After diving through the different option streams, our clear-cut contender for top dog is the HEAD brand (HEAD Men's Shoe, Head Women's Shoe) . Their product lines extend to create many different offerings for the squash community. Their involvement in the sport makes their knowledge base both practiced and perfected, lending them the proper areas of attention when it comes to footwear models. Their models cater to the main areas of focused detailed in our buyer's guide and their price range is competitive with the non-branded options. If you can afford the upgrade, Salming's products make for intriguing options as well Salming Men's Shoe, Salming Women's Shoe). The average or casual user might not need all the bells and whistles emitted from these models, but the incredible inclusions make for their products to be featured as a top selection. Whatever the case may be, ensure you are receiving the proper fit. Try not to give in on width and comfort, as the movements performed with call for a proper fit.